"Blessed is the man who has delight in obeying God completely, whatsoever he does shall prosper." A CHAMPION in a lime and spoon 100, meters race after winning a trophy, was asked by journalists which of the crowd reaction helped him to win. The crowd that cheered and praised him or the crowd that mocked and jeered at him. His response taught us a lesson: Ignoring the two crowd reactions was the secret of his success. Pastor Enoch Adejare Adeboye is a focused Christian and a man of God. He has no time, neither for those who praise him nor for those that mock him and call him names. Adeboye is passionate about salvation, about evangelism, about character, integrity and holiness. He is an incurable soul winner. As a young worker and new convert, he formed a club: "The fishers of men". They would not go to bed any day without winning some souls. Over the years, God has used him to bring joy to many homes enveloped in sorrow caused by barrenness, terminal ailment or children of wealthy parents that were hooked on drugs. At the last RCCG Convention, which was the platform for Femi Aribisala's view, many women that were called barren that Adeboye prayed for in previous conventions brought their children in their hundreds of thousands to give thanks to God and to testify. People brought on wheel chairs got up and began to walk. People with terminal ailments came out for prayer and they were asked to see their doctors and confirm the healing that took place. Adeboye did not want to share in God's glory; so he asked his pastors to lay hands on these people. Under Adeboye's leadership, The Redeemed Christian Church of God established departments that care for the afflicted and the needy. At Christ Against Drug Abuse Ministry, CADAM, we gather drug addicts, heal them and give them education or technical training depending on individual's ability and interest. Habitation of Hope is a home that gathers the homeless and the destitutes and give them hope, education and a future. Many of these are now citizens doing well for themselves. RAPAC is a department that counsels, prays and treats in confidence, people who are HIV positive. Holistic Ministry ministers to prostitutes, rehabilitates them, educates and trains them. 'A CAN can make a difference' provides food for people in the streets and under the bridges. RCCG is preaching the gospel of Jesus Christ in Nigeria and in 187 other nations. 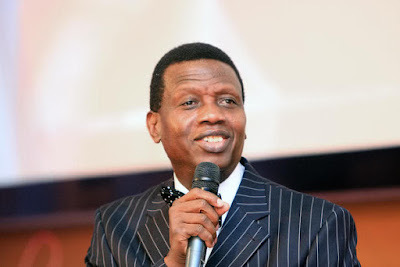 The General Overseer of a Pentecostal church based in Victoria Island, Pastor Femi Aribisala, wearing a mask of social critic and columnist wrote an article: "Adeboye the richest man in the world" at page 47 of Sunday Vanguard of August 16. In the article, Aribisala condemned the ministry of Adeboye, the revered General Overseer of the Redeemed Christian Church of God. Aribisala believes the purpose of building a new auditorium that can accommodate 12 million worshippers in response to God's instructions is because Adeboye wants to make the Guinness Book of Records. Adeboye has his name in the LAMB'S BOOK OF LIFE which is the best achievement any mortal can ever aspire to. Aribisala said: "Pastor Adeboye is using man's wisdom to teach his congregation how to prosper instead of imitating our Lord Jesus who pleaded with his disciples that calamity awaits rich people and that poor people are the blessed people." Aribisala got the gospel mixed up; many scriptures tell us the mind of Christ about wealth, our welfare, our health, salvation and eternity. In 3 John verse 2, the Bible says: "Beloved, I wish above all things that you mayest prosper and be in good health, even as thy soul prospereth". In other words, after salvation, God wants us to have a good health and strong financial resources. In Philippians 4:19, the Bible says: "But my God shall supply all your needs according to his riches in glory by Christ Jesus." That is, the Lord will supply the needs to take the gospel to the uttermost parts of the world. The Bible tells us that Jesus was rich, he was never poor. "The silver is mine, and the gold is mine, says the Lord of hosts"-- Haggai 2:8. The owner of solid minerals cannot be described as poor. In Psalm 50:10, the Bible says: "The Lord of host is rich. The cattle on a thousand hills are His". The gospel of Jesus, however, teaches us not to focus on wealth and that the rich should not be high minded and that our focus should be on things of eternal value. 'Salvation, preaching the gospel' are of eternal value and they have to be funded. Jesus was self-sufficient. He did not carry money or cheque book about but when he needed a thing he would decree it. He rode in the Mercedes Jeep of his time to Jerusalem. He commanded money out of the mouth of a fish when he needed to pay tax. He was not a tax defaulter. The little boy who brought five loaves of bread and two fishes went home with 12 baskets because Jesus wanted to teach his congregation and disciples the principles of financial breakthrough. RCCG is a full gospel church where holiness, divine healing, evangelism and principles of godly prosperity without sorrow are preached. Adeboye used a metaphor when he told the congregation on Saturday of the last convention that he is richer than Bill Gates. In 188 nations, members of RCCG would offer him a place to stay in their personal houses, a privilege Bill Gates does not have. It was a challenge to the workers to win souls. It will be a surprise if Aribisala's church in the home of the wealthy, Victoria Island, is built to look like a temple or synagogue of the Bible days, simply because his understanding is that only poverty can be combined with holiness. It is also amazing that Aribisala's church was not planted in Ajegunle, Idumota or Mushin which agrees with his philosophy that only the poor will enter the Kingdom of God. Another issue is Aribisala's comment that Daddy Adeboye once boasted that those who want to become President will come to RCCG to seek support and that the royalty of the United Kingdom will want to be part of RCCG. The prophecy that political candidates in Nigeria will come to RCCG to solicit support has been fulfilled. In 2011, presidential aspirants came to seek Adeboye's prayer and counsel. Prince Charles, the British crown prince, worshipped in RCCG, Jesus House, London, and commended the efforts of the church. Queen Elizabeth has also endorsed the impact and efforts of RCCG in the United Kingdom. Boris Johnson, the Mayor of London, and Prime Minister David Cameron attended RCCG Festival of Life in London when elections were close by. Adeboye prayed for them and they won their respective elections. Cameron said: "Thank you, Daddy G.O." Aribisala's friends in RCCG should give him those tapes, if he wants to confirm. Reputation law governing charity empowers a charity to raise money publicly if they wish provided the finished product is presented to the donors to see. Adeboye is not a signatory to the project account. He has invited the public to visit the new auditorium even while under construction. Regarding some of our pastors and members who are in political/public offices, we acknowledge that their promotion came from God, it is a wake-up call for increased prayers that insurgency will be crushed and Nigeria will prosper and improve in all fruits for their sake. The big question is this; how does Aribisala have so much time to visit and monitor messages and structures of other churches when he has a flock to feed spiritually? In conclusion, we like to advise and pray for Aribisala. He should preach the truth to his congregation, the full gospel truth--holiness, prosperity, divine healing- and he should challenge them to win souls so that together we can expand the Kingdom of God and extinguish or reduce the size of Satan's Kingdom. He should preach in his Sunday Vanguard column and win souls. The Lord that is rich in mercy will envelope Aribisala in his mercy, overlook his malicious words against us and enlighten his eyes of understanding. Adegbiji, a pastor who wrote this piece, is the head of the RCCG Media and Public Relations.